*Original story available on WKU News. Please visit https://wkunews.wordpress.com/2015/01/15/peacecorps-wellington/ to be taken directly to the story. Katie Wellington, a WKU graduate from Indianapolis, has been accepted into the Peace Corps and will depart for South Africa on Jan. 20 to begin training as a health volunteer. Wellington will live and work at the community level to make a difference raising awareness about the need for education. She will organize projects dedicated to issues such as maternal and child health, basic nutrition, sanitation, oral re-hydration therapy, AIDS and other sexually transmitted diseases. “As a registered dietitian, I will be working with the people of South Africa as a health volunteer with our primary goal to combat malnutrition and the HIV/AIDS endemic that plagues the country’s people,” Wellington said. Wellington, 27, is a 2005 graduate of Cathedral High School in Indianapolis and she earned a bachelor’s degree in hospitality management nutrition and dietetics in 2009 from WKU. She also completed a dietetic internship in 2010 at Ball State University and a pediatric nutrition fellowship in 2012 at Indiana University Purdue University – Indianapolis. Prior to Peace Corps, Wellington worked as a registered dietitian. During the first three months of her service, Wellington will live with a host family in South Africa to learn the local language and integrate into the local culture. After acquiring the language and cultural skills that will help her make a lasting difference, Wellington will be sworn into service and assigned to a community in South Africa where she will serve for two years. Wellington will work in cooperation with the local people and partner organizations on sustainable, community-based development projects that improve the lives of people in South Africa and help Wellington develop leadership, technical and cross-cultural skills that will give her a competitive edge when she returns home. Peace Corps volunteers return from service as global citizens well-positioned for professional opportunities in today’s global job market. There has never been a better time to apply to Peace Corps, and reforms have made the process simpler, faster, and more personalized than ever before. In 2014, applications reached a 22-year high for the agency, with more than 17,000 Americans taking the first step toward international service. Through a one-hour online application, applicants can now choose the countries and programs they’d like to be considered for. Browse available volunteer positions at www.peacecorps.gov/openings. About Peace Corps/South Africa: There are 127 volunteers in South Africa working with their communities on projects in education and health. During their service in South Africa, volunteers learn to speak local languages, including: Afrikaans, isiNdebele, isiZulu, Northern Sotho, Sepedi, Setswana, siSwati, Venda, XiTsongo, and Xhosa. More than 1,285 Peace Corps volunteers have served in South Africa since the program was established in 1997. About the Peace Corps: The Peace Corps sends the best and brightest Americans abroad on behalf of the United States to tackle the most pressing needs of people around the world. Volunteers work at the grassroots level to develop sustainable solutions that address challenges in education, health, economic development, agriculture, environment and youth development. Through their service, volunteers gain a unique cultural understanding and a life-long commitment to service that positions them to succeed in today’s global economy. Since President John F. Kennedy established the Peace Corps in 1961, nearly 220,000 Americans of all ages have served in 140 countries worldwide. For information, visit www.peacecorps.gov. 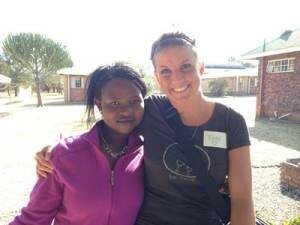 Katie Wellington (right), a 2009 WKU graduate, will be working in South Africa as volunteer for the Peace Corps.